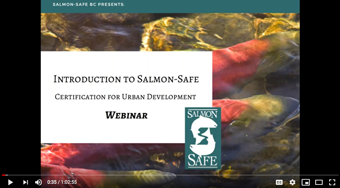 Check out our 2019 webinar video on Salmon-Safe Certification for Urban Development! Follow us on Facebook and Twitter and visit our Salmon-Safe website! Fraser Basin Council and the Pacific Salmon Foundation teamed up in 2011 to deliver Salmon-Safe BC — a third-party eco-certification program that recognizes land management practices that enhance and protect Pacific salmon habitat and water quality. Salmon-Safe certification is available to BC municipalities and regional districts, developers and other landowners in both the private and public sector. The certification can apply to such places as parks and natural areas, college or university campuses, business sites and residential developments in urban, suburban and rural settings. Land can be certified even if it has no watercourses on it. This recognizes that commercial, industrial and residential activities, even those not immediately adjacent to streams and rivers, have long-term cumulative impacts on fish and other aquatic species. 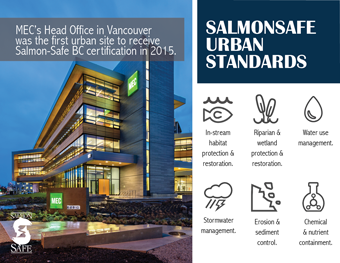 Salmon-Safe Communities for BC, managed by FBC, focuses on best practices in urban and suburban settings. Check out our 2018 backgrounder, and be sure to pass it on! We're looking for communities and developers ready to embark on the journey. Here are the first two of our Salmon-Safe certified sites: Mountain Equipment Co-op (2015) and Vancouver International Airport (2016). 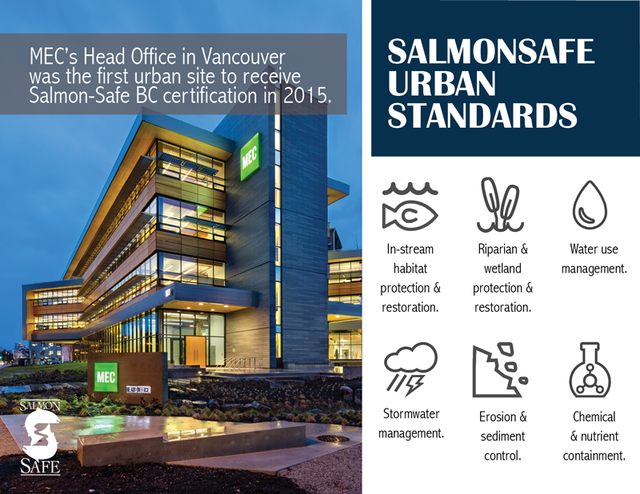 The distinctive building and grounds that comprise the head office campus of MEC (Mountain Equipment Co-op) near the historic eastern terminus of False Creek Flats in Vancouver were certified in 2015 as the first Salmon-Safe urban site in British Columbia. The recognition came from the Fraser Basin Council and Pacific Salmon Foundation, non-profit organizations that jointly deliver the Salmon-Safe program in BC. Check out the details on MEC in our October 23, 2015 media release (PDF | Word) and our Facebook photo album about the MEC head office site. YVR is the first airport in the world to achieve Salmon-Safe certification, which acknowledges YVR's ongoing efforts and commitment to transform land and water management practices to protect Fraser River water quality and enhance Pacific salmon habitat. YVR monitors all water outflow from their airport into the Fraser River for water quality. Watch this video to learn why YVR decided to get Salmon-Safe certified. Could your site be next? We hope so - contact us! 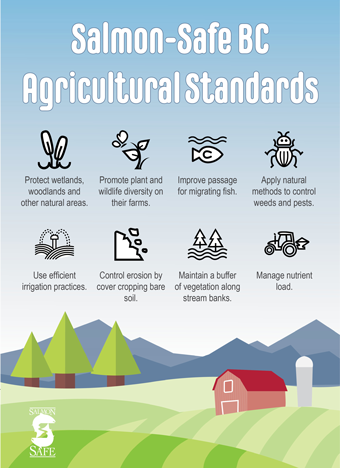 The management of agricultural land is a key focus for Salmon-Safe. Since the program began in the US Pacific Northwest more than 10 years ago, over 300 American farms and 200 vineyards have been certified as Salmon-Safe. The BC program was rolled out 2011, with 22 farms and ranches achieving certification. That number rose to 45 by the end of 2014. To earn the Salmon-Safe designation and right to use the logo in packaging and marketing farm products, a producer must have farm operations evaluated by an independent, professional evaluator. Salmon-Safe certification does not relate to product quality, but confirms that specific environmental standards are followed by the producer. Are you looking for products from a Salmon-Safe farm in BC? Check out the Certified Sites page on the Salmon-Safe BC website. Be sure to visit the Salmon-Safe BC website and bring us your questions and comments. Salmon-Safe BC is pleased to announce that DIALOG Design and Mountain Equipment Co-op (MEC) have won the 2018 Salmon-Safe BC Design Competition for Urban Development. Their winning designs for sites in Vancouver include features for stormwater treatment, water storage and water reuse.